As most of you know, we've been blessed with a boon of baby births around here (not around my house, but friends and family). It's been so fun and exciting to meet these new little ones (especially because it hasn't required any 2:00 AM feedings on my part). The new parents are learning by trial and error--as all new parents do. But I found something on the adorably funny pottymouthmama that just might help. 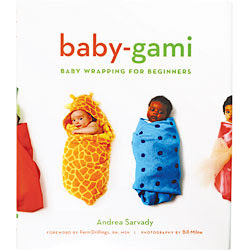 It's a book called baby-gami, baby wrapping for beginners. As you'd expect, it's a well-illustrated 'how to' for new parents, grandparents and anyone else for whom swaddling is a new--and essential--skill that needs mastering. This book will take the intimidation factor out of swaddling and allow every parent--and new baby--the peace and quiet that results from a well-swaddled babe.